If you would like more information upon our range of Large Desks contact The Dorking Desk Shop. 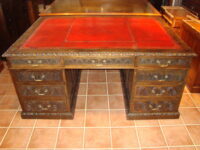 Fine quality solid mahogany, military campaign desk. Victorian carved and solid oak Pedestal Partners Desk. Victorian style mahogany desk of good proportions. Very impressive, Early Victorian, mahogany Dickens desk.